There is an increased urgency around this call to modernize the communications profession, due to the digital transformation that has already taken place in other areas of marketing, sales and even HR. The automation of tasks in those functions, coupled with the ability to use analytics to improve business outcomes, leaves PR at risk of looking more like a cost center than a contributor to key performance indicators like revenue. How PR got to the state it's in now. The idea of how modern communicators can be TEAM (targeted, evolved, agile, measurement) players. The steps to take to start becoming a modern communicator today. As the word “modern” suggests, there’s no time like the present. The time to make changes in your work for the better starts now. 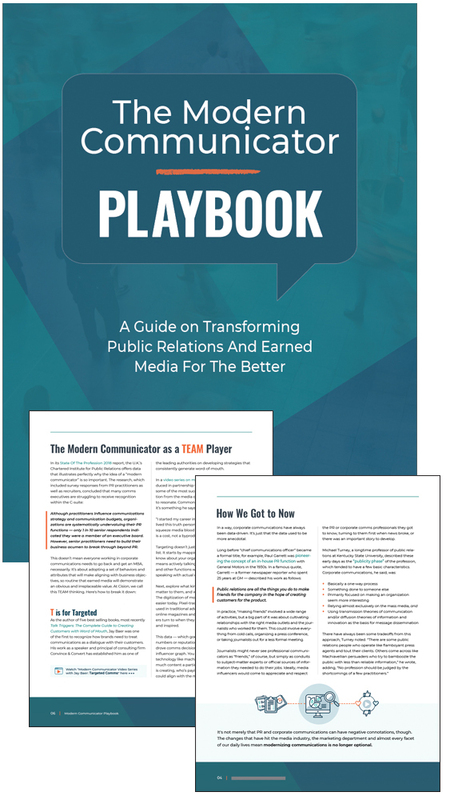 Download the playbook to get started!